In a small saucepan, bring 1 pint of water to a boil, then add the porcini mushrooms. Allow to boil for 2 minutes. Turn the heat off and let mushrooms steep in hot water for 15 to 20 minutes. Meanwhile, bring a large pot of salted water to boil, add the pasta, and cook to al dente, about 7 to 8 minutes. In a medium sauté pan over medium high heat, heat the oil then sauté the shallots until lightly browned, about 5 to 8 minutes. Drain the porcini mushrooms, saving the water. Chop them and add them along with the button mushrooms to the pan with the shallots. Sauté 4 to 5 minutes until the button mushrooms are lightly golden. Reduce the heat to medium and add the mascarpone and the cream. Stir slowly until everything blends. Add half the porcini mushroom water and the parmesan cheese. Let this sauce reduce so it thickens a little, about 10 minutes. Stir in salt and pepper to taste. Remove from the heat and allow to come to room temperature. Put the mushroom mixture into the blender and mix until the mushrooms are in tiny pieces. 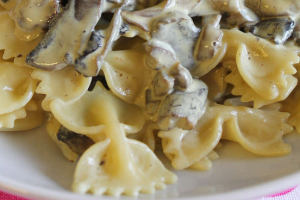 Heat a large sauté pan over medium- high heat, add the mushroom sauce, and the farfalle. Mix well until heated through and serve hot.